Jamie Donaldson signed for a three-under 69 to maintain his one-shot lead and set the clubhouse target at 13 under par 131 on a fog-delayed Friday schedule at the Omega Dubai Desert Classic. 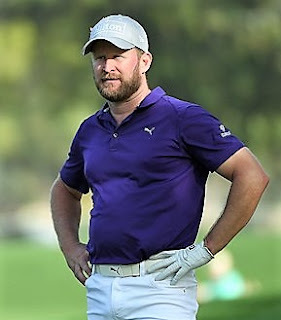 The Welshman, pictured, fired a blistering 62 on day one and while he could not quite hit those heights again at Emirates Golf Club, he continues to lead a field that has just 11 players over par. China's Li Haotong heads up the chasing pack at 12 under par 132 after consecutive rounds of 66. South African Branden Grace is one shot further back alongside Alexander Björk of Sweden, who is one of 66 players who will return at 7.30 am on Saturday to complete the second round following a 2hr 50min delay due to morning fog. Miguel Ángel Jiménez rolled back the years with a round of 68 that included six birdies and one bogey, to take the 54-year-old Spaniard, a 21-time European Tour winner, to ten under par, alongside South African Thomas Aiken and four-time Major winner Rory McIlroy, who will complete his remaining seven holes on Saturday morning. Jamie Donaldson: “I played nicely. Drove the ball well. Iron play was good. Took my chances when I was close enough to do so. Hit a lot of really good putts that didn't go in, whereas yesterday they all went in, but 69 following a 62 is a solid score. “It can always be better, can't it, but only one bogey. I wanted to try to go flag hunting a little bit which maybe I shouldn't have done, but happy with how I played. Miguel Ángel Jiménez: “I hit very nice, solid, controlled the ball. That's what you need to do, and I enjoyed it very much. It's a nice golf course. I won here in 2010, and it’s a golf course where I feel like I can defend myself with my game, and here we are. “I still like to play on The European Tour. Obviously now 90 per cent of the tournaments I play on the Champions Tour, but I still love to come here to some tournaments. The golf course, it's a golf course that I can defend myself and play and be competitive. That's what I want to, and see another new generation of guys coming up. I see a lot of faces I don't know here. That's good.”Rory McIlroy: “I'm in a good position. It was hard waiting all day to go out there. I got off to a really good start, three under through five, and then made my first bogey of the week on the eighth, which was a bad tee shot. I nearly got away with a par but dropped shot. “But it was nice to get a shot back there on 10 at the end of the round. Hopefully I can come out in the morning and make a few more birdies and get closer to the lead.